APPLICATION FOR USE OF STREETS AND PUBLIC GROUNDS FOR PARADES AND OTHER EVENTS (CHAPTER 7.18.7 - CODE OF IOWA CITY) All applications must be filed at least thirty (30) days in advance of the date requested unless the City Manager waives the time requirement. Administrative review by the departments and the City Manager usually takes 3-5 working days. Upon granting or denying the application, the City manager is required to notify the City Council. The City Manager may waive any of the requirements of Section 7.18.6. This notice must be included on the Council agenda by Thursday noon. At the Council meeting the following Tuesday, the City Council will either confirm or set aside the action of the City Manager. The applicant will be mailed notification of the City Manager's decision at the same time the notice is sent to the City Council. 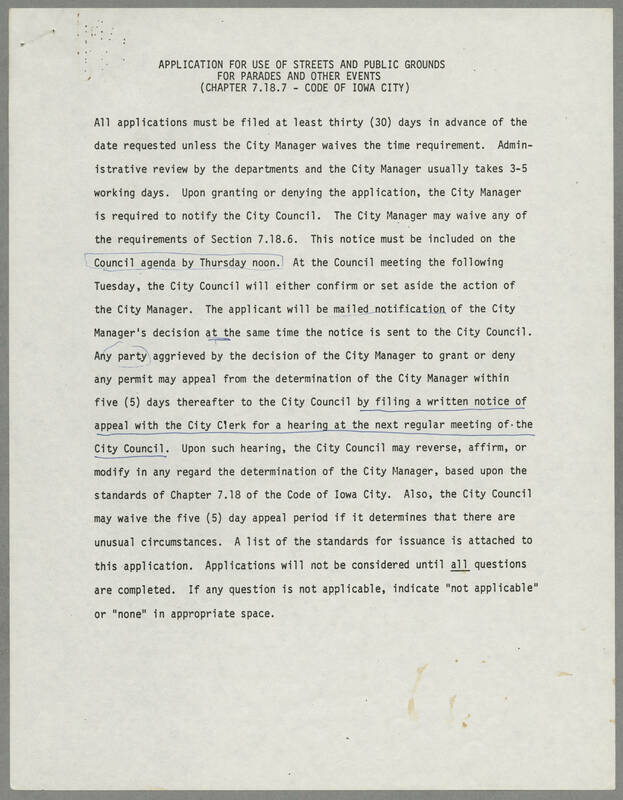 Any party aggrieved by the decision of the City Manager to grant or deny any permit may appeal from the determination of the City Manager within five (5) days thereafter to the City Council by filing a written notice of appeal with the City Clerk for a hearing at the next regular meeting of the City Council. Upon such hearing, the City Council may reverse, affirm or modify in any regard the determination of the City Manager, based upon the standards of Chapter 7.18 of the Code of Iowa City. Also, the City Council may waive the five (5) day appeal period if it determines that there are unusual circumstances A list of the standards for issuance is attached to this application. Applications will not be considered until all questions are completed. If any question is not applicable, indicate "not applicable" or "none" in appropriate space.